While I cannot actively promote criminal activity on this site for fear of The Man coming to confiscate my freedom and my jewelry collection, I will tell you the best place to find the best boyfriend cardigan is in someone else’s closet. It could POSSIBLY be in your husband/boyfriend/roommate’s closet. But I wouldn’t know. You, however, should totally check that out. The boyfriend cardigan has come along way since the the Richie Cunningham version of the 1950s. Modernly paired with skinny jeans, a wispy tank top, some killer boots and a thin belt this updated silhouette is less “Happy Days” and more Street Chic. 1. The classic version has four buttons and two front pockets. 2. Don’t be afraid to shop the mens section for this. 3. Pick up a few for spring and summer and chunkier versions for the fall and winter. Cashmere is always in style. 4. For a menswear twist, layer a thin cardigan under a blazer. 5. That gold one up above? Seasonless. 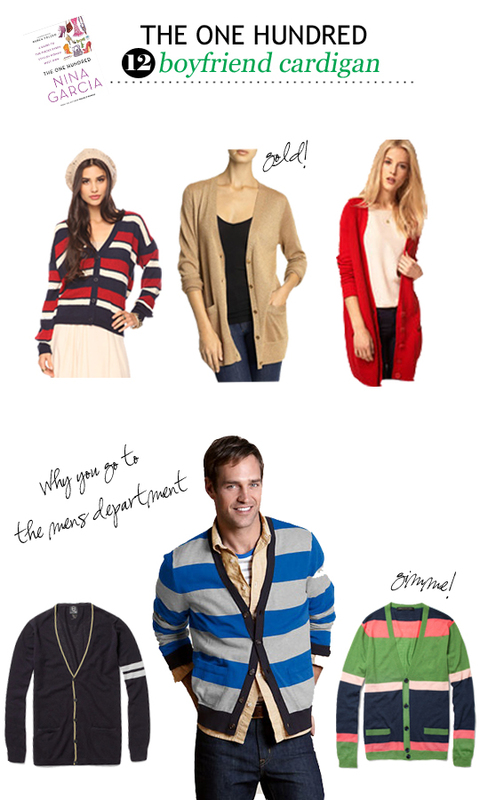 Want to learn more about boyfriend cardigans? Of course you do. Pick up a copy of Nina Garcia’s “The One Hundred” for yourself! We’re working our way through all 100 items to assemble the perfectly stylish, workable collection.